Last year, for the first time in my life, I gardened. I chronicled the experience here on the site, posting update every few weeks. I’m planning on posting again each week, starting later in this spring and going through the summer. Whether you’ve got one pot of herbs, a planter, a container garden, a full fledged “in the ground” garden, I wanna hear about it! I LOVED reading about other people’s gardens, and learning from each other too! Because we have so many trees (48 on a half acre), we have very little “full sun” space. So we decided that square foot gardening would be the best way to garden in our yard. So I will plant again in the planters. And I will also plant some veggies out where the grapevine lives. The very back corner of our property, which currently houses 2 grapevines, is the only other space that gets “full sun.” And I “quote” the phrase “full sun” because these spaces barely get “full sun.” But its enough for the plants to grow! Also, you can request a free plant marker to help with organizing your garden! Thanks Free Stuff 4 Free! If you are interested in learning more about square foot gardening, I recommend Square Foot Gardening by Mel Bartholemew. I’ve loved the concept and it works beautifully for the limited space that we have! Here’s hoping for another great year of Square Foot Gardening! Will you be gardening this year??? Would love to hear some of your gardening secrets and/or methods!!! I am looking forward to following your garden again, in more ways than one. You begin harvesting many of your vegetables a week or two before me and have time to create delicious recipes, before I bring my veggies in, minimizing my work in the kitchen. Thank you! I agree with your recommendation on Square Foot Gardening. Even though I live on 2 1/2 acres I use this method. 2. In fall, plant some greens or leave what is growing in through the winter. My curly parsley, a couple of lettuces, arugula, and spinach have survived below zero temperatures and several snowstorms of 12+ inches of snow. Being in Texas, we had to start a good deal earlier than you will. I plan on posting about planting, and sprouts tomorrow. The gardening MrLinky is a great idea. I’ll definitely follow along. Can’t wait till I’m getting to show off veggies! I can’t wait to see your progress! We live in an urban core, so having a home garden can be a bit of a challenge too. We have limited space, but planters have worked well. I tried herbs last year, but would love to add some basic veggies this time. Our biggest problem? Litter! Ewww, right? Thinking about a higher raised bed this time and maybe some screening. Happy gardening! We are really hoping to do our first garden this year. We eat enough we figure it would be cost saving to just grow our own veggies and maybe some fruit. Do you only do veggies? We were thinking about watermelon at least. It’s something my kids actually love, and myself as well, so that would get eaten for sure. We have a large yard in direct sun for at least half the day. I’m at a loss as to know how to get started though…like what to plant and how to organize it. If you have any good websites or suggestions they’re most welcome! I can’t wait to read your posts on gardening, we did indeed garden last year and my hubby has Mel’s book and likes to do the sq ft gardening. We are waiting for warmer weather to start getting back outside again. We rent & I hope to move in the next month & I’m hoping someone would let me have a garden…I know I’ll probably start late but free, fresh food is better than store bought. I’m totally on board with you on this gardening thing! This will be our second attempt at a garden. I’ve read some about the “lasagna gardening” technique and we tried it this year…but oops! I messed up…you can read about it on my blog. We just started some tomato seeds indoor and they are looking lovely! Can’t wait to see what you get this year! It’s so fun! Not sure if you’re building your own compost bin or not, but I wanted to mention that if you contact your local county extension agent, they might be able to get you a deal on a very large black plastic compost bin. we got ours (and a very nice pail for in the kitchen) through our extension office and paid maybe $40 for both things. Looking forward to seeing your progress this year! I’m going to expand off the deck this year into a full square foot garden. I loved your posts last year and learned a bunch. Funny–I went to by Square Ft Gardening on Amazon and accidentally bought the Square Foot Gardening Cookbook…that was a good read too! Looking forward to the warm weather!!!!!!!!! I have been growing a garden for a few years, getting better each year. This year we are going much more in-depth. We made a plan and everything. I also decided to start all of my bedding flowers in the seed starting cells this year, so as to save $50-100. We’ll see how it works out. I’ve also been reading a lot on how to grow things indoors, and next fall I will be planting things like chard, lettuce, and spinach to grow indoors in pots. We’ll see how that venture goes! I bought my seeds on Thursday. I haven’t decided where my garden is going yet, though. We have a HUGE yard, but also have a LOT of critters. I’ve tried patio gardening the last couple of years w/ little success, but if I can convince my hubbie to build my a platform like yours, I might have better success! I love reading about people’s gardens! It helps remind me of all the things I need to do for mine, as well as not get too frustrated when my garden isn’t producing perfectly. We all have setbacks, right? and it has worked great for us! 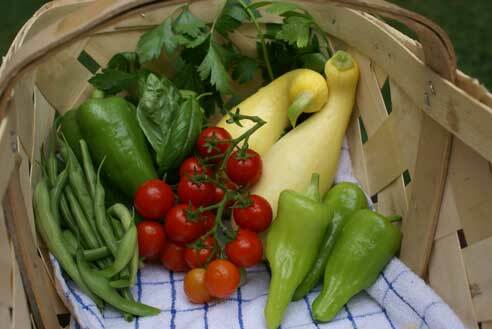 I have been Square Foot Gardening for 5 years and it is great! Even though our garden is now over an acre, we still use the principles. It makes the planning so much easier! Yes, I will be square foot gardening again this year. I can’t plant anything until after Memorial Day or it will freeze. We are planning to turn a useless flower bed into a square foot garden as well. Last year was a learning experience for me, as well, as I learned what was and was not worth planting in my 4 beds. Thanks for all you share. That looks like a great way to garden for a small space. I’m just wondering why you put your planters on your patio rather than on soil. Do the roots have enough room to grow? I wondered the same thing, as the patio planter is only 6 inches deep, but what you see in that photo is how much it grew…there was plenty of space for the roots. My tomato plants were HUGE…and their roots spread deep and wide. Erin, count me in! My daughter has wanted a garden for years but it’s hot here in summer (desert SW) and in the past even my containers have given up in the heat. With a partner I’m sure it will be much easier. Thank you for the inspiration. I garden in the desert southwest! Containers are harder here; you have to water them every day. I saw the $5 dinner book at Albertson’s the other day – is that yours too? If so, I will buy it.! That would be my book! I hope you enter, and good luck this year with your garden! I will be gardening this year again! It will be good to have a place to link up my Gardening Thursday. How fun! Can’t wait to share about my garden. I started a Square Foot Garden last year as well. I just planted my late winter crop of potatoes, onions and english peas. I am going to put lettuce in my only empty bed in the next couple of days. We are planning on building 4 additional beds this spring. I am going to square foot garden as well this year, thanks to you. I found Square Foot Gardening book by Mel Bartholomew at Lowes. Couldn’t get it in town here as the garden center ordered the older version. Oh well, have bought a few seeds and will get the lumber soon. So will share my blog with you when I get mine going. Sounds fun!!! And some work involved but I think I’ll like it better than having to dig up the hard, clay ground we have here. Back spot behind our house seems to get most sun. So will put it there, out of sight where others don’t see it. Still will put a fence around it to keep out birds and raccoons and opossum here, even in town. There is a greenbelt behind us and these have been seen in the vicinty, including our back yard and huge tree!! :0) Thanks again for your inspiration!!! I’ll be gardening again this year, also. I hope to try a couple new techniques this year: silver metallic compost (reduces pest problems while increasing fruit size, can be found online at http://www.sweettomatotestgarden.com/index2.html). 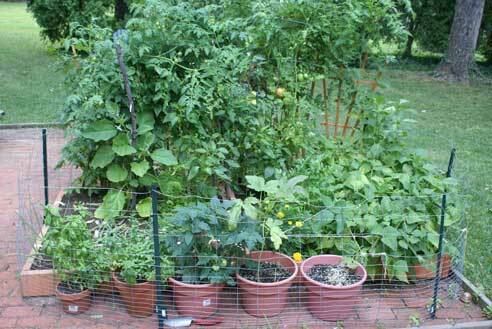 Also considering trellising the tomatoes this year instead of cages or stakes. Not sure how things will turn out, but those are the ideas so far. I’d be interested in learning how others have their gardens set up! I will of course be gardening this year. 🙂 A bit funky since we’re not 100% sure whether we’re moving or not, but still. As of this year, I’ve got 1200sf of garden spots in the yard (some in-ground, some raised beds), and a dozen fruit trees on our little city-sized lot. But since I just had another baby and the whole moving thing, we’re container-gardening it up in all manner of ways, in addition to making the yard look pretty. In the meantime though I’ll be able to take advantage of the first harvest of asparagus I planted while 42 weeks pregnant with my almost 2yo. Last year was my first garden and I loved it. Can’t wait to try it again this year and now it will be great to have someone to share and compare with. Thank you. Like you I started my squarefoot garden last year. I love it I did peppers, tomatoes and other veggies. This year I plan on adding another bed and doing one for just salads. This keeps me quite busy and people are always coming by to see what I have. I will be following your garden efforts. Have fun. I hadn’t seen square foot gardening before you did it last year. I have a full garden, but it has definitely given me some ideas on how to maximize the space I have. I tend to give myself a lot of working room in the garden, which is good, but I have big plans and aspirations this year that will occupy more space than in the past. This is really encouraging. I always want to garden and my grandma is a great gardener. I’m just spooked by the insects, but I think I’m going to chalk it up and give it a try this year starting with herbs and see what comes out of that. I thank you and my grandma is going to be so happy now. I saw this idea last year and will be trying it this year using kiddie pools for the raised beds. I am going to attempt gardening again this year, last year was a total bust. I must have black thumbs or something because they sure aren’t green. Could I ask you one question? I would like to do the raised bed like you have. I’m wondering where you got the dirt to fill it in? Do garden centers sell it and do you buy a special kind for vegetable gardens? I made my own dirt mix with peat moss, perlite, manure. I followed the proportions in the SFG book mentioned in the post. Peat moss is about $10/big bag (can’t remember the exact cubic feet) here. That is so neat that you just posted this. I just made my first 4 x 4 garden today. I have had the square foot gardening book for years, but haven’t been able to utilize it until now. We recently moved, and I finally have the space. I am so excited. I decided to start out with one reasonable size garden and add more as I become more confident in my gardening. I am looking forward to reading your gardening posts, and I’ll have to check out your old ones!! We live in the city but we did two large planters last year. One with a cherry tomato plant and the other with green pepper. This was mostly so the kidlets could see things grow and because our youngest can eat her weight in tomatoes. We belong to a CSA that we get the bulk of our veggies from but I’m planning to do the planter garden again this year and add some herbs. We just got rain barrels that are repurposed/ recycled from the soy sauce manufacturer near by ’cause you never know if it’ll be a dry or wet kind of year. Erin this is fabulous info. I have been trying to study last years info. I also watch the gardening posts f=on Jane4girls800dollarannualbudget. She had a post that mentioned Free or Cheap plants. Here is the link if anyone is interested. I’m sorry I am extremely new to blogging and don’t know how to turn this into an accessable link on someone else’s blog. What soil mix did you use. The one from the book uses vermiculite and I have ready some differing opinions on that. He recommends a soil mix in the book. I forgot it had the vermiculite. I did use that too! ok…sorry, just read the other posts. There’s my answer. I guess my new questions is where did you get the vermiculite? I’m pretty sure I found it at Lowe’s. But I had to ask where it was! Because I couldn’t find it! What’s the Mr. Linky thing? It’s a place where you can link up your gardening posts from your blog. Why not cut down a few trees to give you more sun? You could replace some of them with fruit trees instead so that you could have even more from your garden. You could probably put in several fruit bushes as well. I have just under a quarter acre in the desert. I have 33 fruit trees (half of them are espaliered along a couple of walls). I just put my tomato plants in the ground 2 weeks ago (we’re a zone 9). I change the pictures out to show what is blooming/what we’re harvesting right now. as well as see links to more edible landscaping ideas and plans for anyone who is looking to design a garden. My goal is to always have something to harvest. Right now, I can pick green onions, swiss chard, turnips, lettuce, and a large variety of herbs. Within the month, I’ll have sugar snap peas, asparagus, and spinach. We’re having beautiful weather here. My fruit trees are blossoming and my artichoke plants are getting really big! Last year we harvested 100 artichokes; we’re excited for this year! I’d love to! I sit in the back yard looking up at the trees thinking of which ones to cut. The trees are HUGE! And would require us hiring people…and it would likely cost in the thousands to cut enough out! Looking forward to watching your garden grow too! My children think huge trees are palm trees, LOL. Climbing trees are really rare here. It would be easiet to cut the trees now, while they’re dormant. You can grow so much in a half acre! We grow a ton in our yard, and you have twice as much space! (Plus a more temperate climate, so your tomatoes won’t stop producing in summer like ours do; they stop fruiting at 90º and we have 5-6 months of 90º -116º temperatures). I wish we could do it ourselves. Seriously, they are HUGE…so tall!!! I’ve been gardening for several years and incorporated the square foot method into my 40′ x 40′ garden last year to great results. I enjoy it so much and the time savings I gained using this method have inspired me to start a small CSA this year with hopes of growing it to a full-time business in successive years. I’ll enjoy seeing how your garden does! That’s so great Trudy! Blessings as you “grow” and expand your business! I have raised beds that are essentially the same concept as the SFG plans…I wanted to recommend a few of my favorites, as I have been reading a lot of garden books over the last 15 years and am very passionate about growing. OK, next is the four season harvest by elliot coleman…he breaks it down how to grow a lot of veggies ALL YEAR long and he lives in Maine, so if he can do that, people in alaska can do it (as i am sure many do)…it is a great read and will spark your imagination even if you only use cloches or coldframes. ok the third is “fruits nuts and berries for the home gardener” by lewis hill. that is the best book about home fruit you can get, and is written in a very simple and straight forward way, like talking to a neighbor. anyways, I really am enjoying your blog, LOVE the fact that you and your readers are looking at SFG as a great way to stretch the grocery budget and learn about what goes into the food you eat everyday….and the kids have a blast out there in the dirt, playing with the worms!!! I wish you and your readers the best of luck with your garden this year and I will definitely be looking into getting your book…after I have a chance to glean what I can from your BLog!!! Thanks for the great recos Misty! I’m gonna check them out at the library! And also for the composting idea too! My seeds are coming this week, and I’m hoping to get them in the ground soon. I’m a little late for Spring garden but the ground has been too wet. I’m looking forward to your garden posts. We have always had a cubed foot garden and EarthBoxes. Just writing an article now about the money savings! My husband and I are going to venture into gardening this year! Did you do any root vegetables? I’d love to try sweet potatoes but we are going to do a raised bed like yours and didn’t know if that was deep enough for carrots, potatoes, and whatnot. 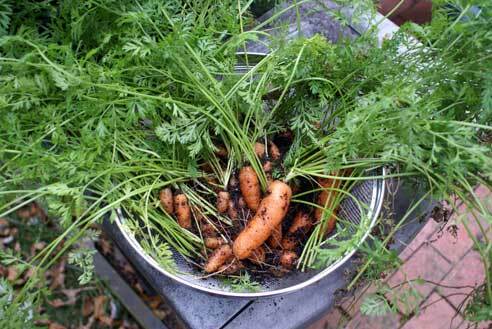 I only did carrots last year…am thinking about trying some root vegetables in some large containers that I’ve got?!? We’ll see…my plan is still evolving! Well we started our garden yesterday! I can’t wait to see how it unfolds!